Chola sadam a forgotten native food. Millets have a considerable effect on our health. Regular consumption can defintely provide us with its benefits and of course with a lifestyle change. Pressure cook toor dhal with green chillies, tomatoes and turmeric powder for 5 whistles. Once cooled mash well and keep aside. In a deep pan, heat oil add mustard seeds once it cracks add curry leaves, pearl onions and saute well. Add veggies one by one add the one which takes longer time to cook and add salt. Stir fry well and cook for 2 mins add 1 cup water, tamarind paste and the ground powder. Cook until raw smell leaves. Add dhal and mix well and cook for couple more mins. 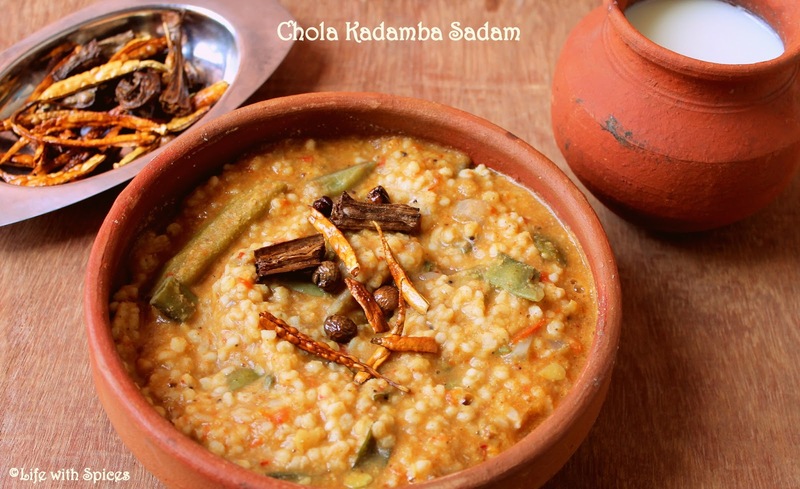 Now add cooked cholam mix well and serve hot with vathal and a big glass of neer more. This is very new to me. ..sounds really interesting. did nt know these :) looking yummy :) lovely props ! Looks so delicious and beautiful presentation. Am drooling.. Picture & health perfect.. Cholam sadam, moru neer & vathal mulagai.. What more do u need?? Slurpp..
Wow sounds super delicious, nice click too :) Yum!!! Healthy and yumm!! Healthy and delicious rice. Seems to be very comforting..
Nice presentation n authentic recipe,sooo good!! Adada wat a healthy food, completely my kind of dish..Kalakals.